This image has captured the essence of all I've wanted to say this fall in our series, "Once I was lost... finding my way back home." 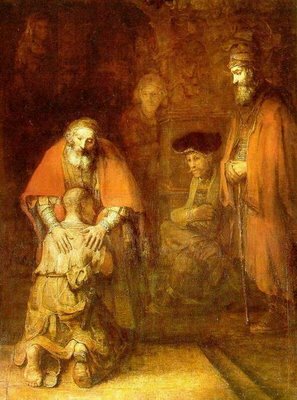 This is Rembrandt's depiction of the return of the prodigal son (Luke 15). The more I look at this painting the more I am moved by it. By the way, I plan to show this image coming up during my message on Sunday, Nov. 26. Welcome to the blogoshpere. I look forward to reading your posts.